CAR-T – or Chimeric Antigen Receptor T-cell therapies herald a new wave of therapies in cancer. CAR-T therapies involve taking T-cells from the immune system and genetically engineering them so that they can seek and destroy cells. At the moment CAR-Ts are only approved in blood cancers but cell therapies have the potential to become a new treatment option in solid tumours too. While the treatments are powerful, they do have a few drawbacks as it can over-stimulate tghe immune system, potentially causing cytokine release syndrome (CRS) or other toxicities that can be life-threatening if not managed properly. In the build-up to the recent American Society of Clinical Oncology (ASCO) meeting CAR-T therapies have been named as “advance of the year”. Scientists continue working on a successful treatment which potentially can be used in the future cancer care. ASCO was the perfect place to present the most recent research data. One of the pharmas heavily involved in the CAR-T technology is bluebird bio, a partner of the US giant Celgene. Their bb2121 therapy prevented very advanced multiple myeloma from spreading for 11.8 months – a progression-free survival figure that disappointed investors even though the patient group involved was extremely ill. Meanwhile latest data from Juno’s JCAR017, also known as lisocabtagene maraleucel, shows that serious safety issues and deaths, which led to trials of its other CAR-T being stopped, have not been an issue. Juno is testing the treatment, nicknamed liso-cel, in patients with relapsed/refractory aggressive B-cell non-Hodgkin lymphoma – a disease where both Novartis’ Kymriah (tisagenlecleucel) and Gilead/Kite’s Yescarta (axicabtagene ciloleucel) are already approved. The CAR-T therapies, which are already approved were also discussed at ASCO and represented what could be a new wave of powerful cell therapies. While technically impressive, making a personalised therapy from a patient’s own T-cells is a very expensive and laborious process. The scientists are looking into an option of the next wave of cell therapies. These would be almost available ‘off the shelf’, could be produced in advance and stored in bulk. This would give them a significant advantage over exiting time-consuming therapies. Using generic T cells armed with specific weapon against cancer would also allow to use cells derived from stronger precursors. “The biggest benefit is the fact that we can use much younger, healthier cells. CAR-T patients are often older and fundamentally a young person has a higher functioning thymus (the organ that stimulates development of T-cells)”, added Sasine. Our reporter Richard Staines has more details from the ASCO 2018 conference about CAR-T therapies. Read the full article: CART-Ts take centre stage again to get more insights and scientific details. 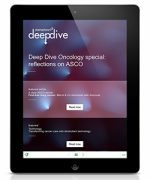 Click here to read more articles in our recent Deep Dive Oncology special edition. If you would like to read previous editions of Deep Dive, and sign up receive future editions, please visit the Deep Dive page on the website.